Nathaniel Galloway was another river runner around Powell’s time. While Powell and his team opted to face rapids head-on or portage anything deemed too dangerous, Galloway had a different method. Traditional rowing methods required the rower to view the water in front of them over their shoulder which impeded on the ability to gauge the severity of the rapids. Galloway introduced the idea of ferrying. The Galloway method involved facing downstream and using the current wisely to let the river do the work. By turning the boat at certain angles speed and direction could be manipulated instead of pushing straight ahead with brute force. Galloway would also introduce the closest predecessor to the Grand Canyon dories of today. His wooden boats were a more sleek and agile version of Powell’s boats. They remained the most in-demand boat on the river until the introduction of rubber rafts. 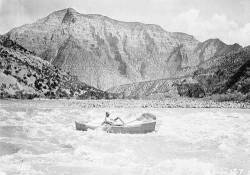 He started by running the Green River in 1896. After many shorter trips he was commissioned to build 4 of his boats and lead a 3 month trip from Wyoming to California.